Volunteers will help count and map NYC's street trees. More than 2,000 New Yorkers will spend part of their summer counting and mapping the city’s street trees. The “voluntreers,” as the NYC Parks Department is calling them, hit the streets last week equipped with measuring wheels, measuring tape and field worksheets as part of the TreesCount! 2015 campaign, New York City’s third decennial tree census. In April 2007 former Mayor Michael Bloomberg and the New York Restoration Project, a non-profit founded by Bette Midler, launched Million Trees NYC, an initiative that set out to plant and care for one million trees throughout the city’s five boroughs within ten years. According to the initiative’s website, more than 900,000 trees have been planted since it began, over 200,000 of them street trees, and the city depends on volunteers to help catalog them and track their health. Silva and his partner Liz Barry co-founded TreeKIT, an organization dedicated to providing volunteers with the tools necessary to identify, measure and map the city’s street trees. 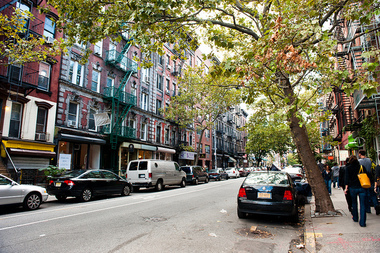 Silva said the idea for TreeKIT came after realizing New Yorkers had been caring for trees on their blocks for decades, most of the time unaware that their neighbors were doing so too. So he and Barry developed a web-based way to track trees, count them and turn the numbers into a map, all the while connecting tree-loving civilians. Tree census volunteers will log the data they find using a mobile app developed by TreeKIT and revamped by Azavea, a Philadelphia map software development firm. Tree counting is not a job reserved for scientists (dendrologists, to be more specific). Silva said he has encountered folks from all walks of life, young and old, who want to give back to their community, learn about botany and plant identification or simply participate in a group activity. “We’ve had a diversity of volunteers that really reflects the diversity of New York residents,” Silva said. Over 2,000 volunteers have signed up since registration opened in April, according to the TreesCount! website, and more than 4,000 trees have been counted since the campaign kicked off on May 19. Aspiring tree counters can register online through the NYC Parks website. After going though an online orientation and a day training out on the field, volunteers can start mapping on their own or join one of the dozens of groups that have partnered with NYC Parks to host mapping events. Slots, however, are filling up fast.